For other uses, see Galba (disambiguation). "Servius Sulpicius Galba" redirects here. For other uses, see Servius Sulpicius Galba (disambiguation). Galba (Latin: Servius Sulpicius Galba Caesar Augustus; 24 December 3 BC – 15 January 69), pron. /ˈsɜːrviəs sʌlˈpɪʃəs ˈɡælbə/, was Roman Emperor for seven months from 68 to 69. 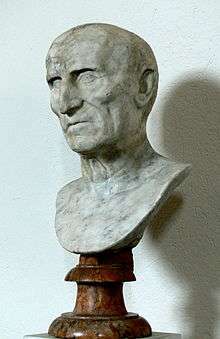 Galba was the governor of Hispania Tarraconensis, and made a bid for the throne during the rebellion of Julius Vindex. He was the first emperor of the Year of the Four Emperors and the last emperor born in the First Century BC. During the later period of his provincial administration, Galba was indolent and apathetic, but this was due either to a desire not to attract Nero's notice or to the growing infirmities of age. Tacitus says all pronounced him worthy of the empire, until he became emperor ("omnium consensū cāpax imperiī nisi imperasset"). ↑ The following quote is NOT in Suetonius and has been removed to a footnote until the citation can be corrected and/or verified. ... Suetonius mentions that "Galba Minor had discovered his father's affair with a male slave and threatened to tell his step-mother, which led to death of him." ↑ "Calvia Crispinilla". Women of History. A Bit of History. Retrieved June 11, 2012. 1 2 3 4 Suetonious. The Twelve Caesars. Penguin. pp. 242–254. ISBN 978-0-14-045516-8. This article incorporates text from a publication now in the public domain: Chisholm, Hugh, ed. (1911). "Galba, Servius Sulpicius (emperor)". Encyclopædia Britannica (11th ed.). Cambridge University Press. Wikimedia Commons has media related to Galba.